Golden Leaders Sports Badge - reverse. The badge consists of a circle that measures 40 mm and has a wreath of laurel leaves that goes round the outer edge. It has nine bunches of three leaves on either side which measure 3 mm across. Inside these is a raised 1 mm line. 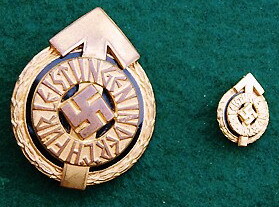 The central field is in filled dark blue opaque enamel and over this is superimposed the Hitler Youth Proficiency Badge. 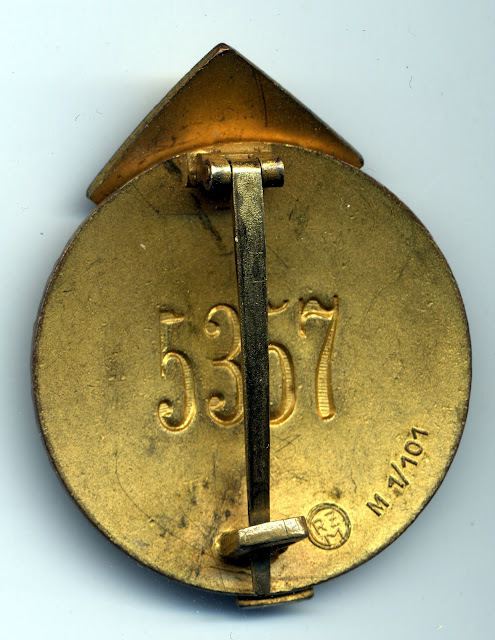 The badge is produced in tomback that is gilded. The reverse is semi dished with a hinge and 'C' type hook, with a tapering flat pin. Raised on to the back plate is found the RZM logo and the manufacturer's mark. 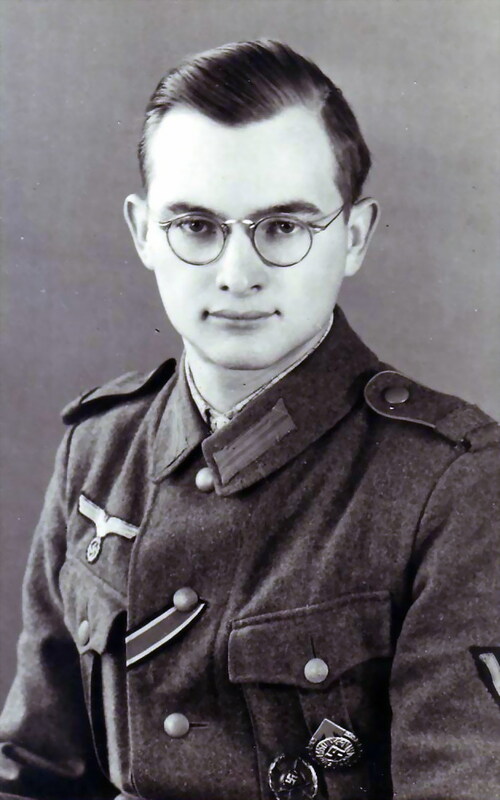 There is only one known maker M1/101 Gustav Brehmer. 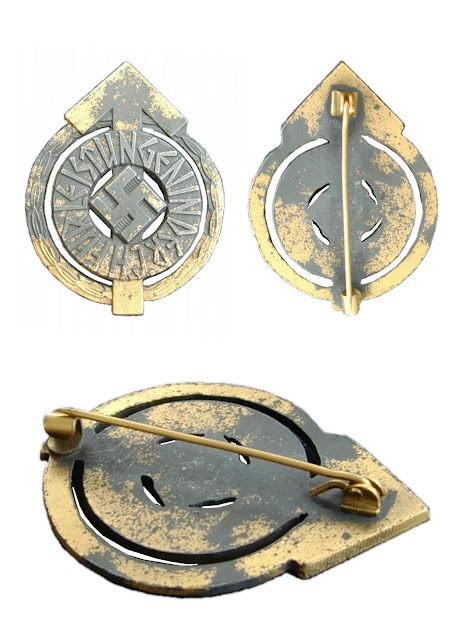 Three types of clasp can be encountered, that which has the issue number of the badge impressed or a large impressed capital 'A' or 'B'. On 18th January 1937 Reichsjugendführer Balder von Schirach, decreed that all HJ and DJ leaders from the rank of Fähnleinführer and higher to Gefolgschaftsführer and higher, including those on the RJF staff, Gebiet staff, Bann staff and Jungbann staff, would be required to pass a ten part test to be known as the leaders test exercises. 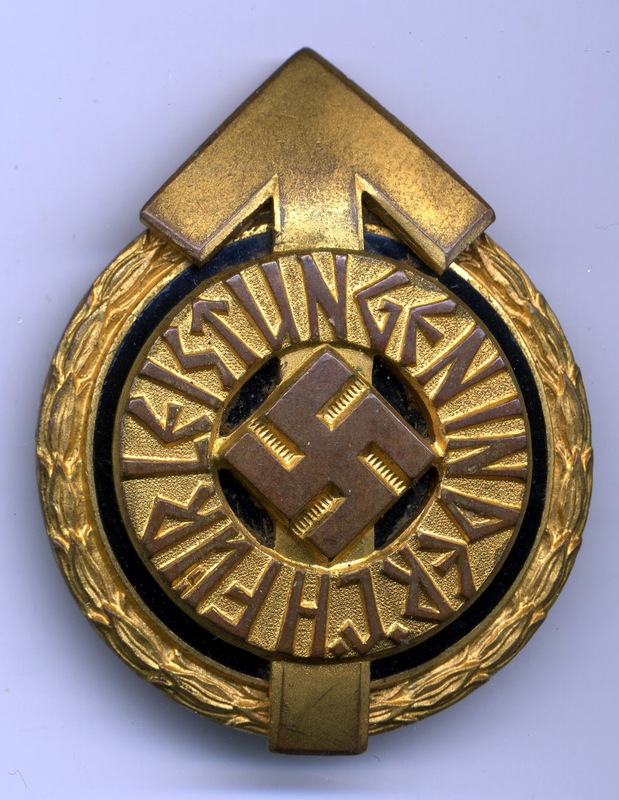 Reichsjugendführer Balder von Schirach, to be awarded annually to the high scorers in the leaders test exercises, instituted this award on 15th May 1938. There was no limitation placed upon the number of recipients provided that they met the necessary qualifications. A Grade: 18-32 years, requiring 7500 points to qualify. B Grade: 33 years and older, requiring 6500 points to qualify. e) Throwing club accuracy test. h) Marksman qualification, both supported and unsupported. i) Cross-country navigation test together with road march in full pack. The badge was awarded for a period of five years and to continue wearing the badge after this point the leader had to achieve the required points total twice more before the 5 years were up. This never actually happened because it was decided to suspend re-qualification in 1943 until after the war. If a leader had failed to achieve re-qualification the badge would have to be forfeited. A further part of the qualification criteria stated that any leader older than 35 who was able to satisfy the requirements of A Grade would never again be required to requalify for the badge. The first awards were presented at the 1938 Nürnberg Party Rally. The numbers of badges awarded varies depending on the source but it's likely to be somewhere between 11000 and 15000 that would have been won by 1943 when the award was suspended. Early regulations were unclear as to how the badge was to be worn, with the result that most were worn on the right breast pocket. Regulations in 1942 specified that the badge was to be worn on the left breast pocket of the uniform. A miniature could be worn on the left lapel of civilian clothes and it is said that a cloth version of the badge exists for the sports kit. However, this is unconfirmed. It was awarded with a citation in printed text with a drawing of the badge at the centre. The recipient’s details, the year when it had been awarded, the badge number and when it expired were hand written. It was signed by the Reichsjugendführer. The case is burgundy coloured cardboard with burgundy velvet base and white satin lid interior. There is no lid designation. Golden Leaders Sports Badge in wear. Golden Leaders Sports Badge - Fakes.